In news that will surely be as divisive as The Last Jedi, Lucasfilm boss Kathleen Kennedy will continue to lord over the Star Wars franchise as Lucasfilm extends her deal for three more years. Many expected Disney and Lucasfilm to boot the producer out of office in late September or early October, but the exact opposite has happened. Some are very happy about this, while others are running, screaming, crying and kicking at the ceiling fan. While many love what has become of Star Wars under Kathleen Kennedy's watch, others firmly believe that she's destroyed the franchise, some even calling it irreparable. Kathleen Kennedy is the lead producer of the current Star Wars franchise and also serves the same purpose on the upcoming Indiana Jones sequel which will reunite director Steven Spielberg and Harrison Ford one last time. She is the main architect of what Star Was has become since it landed at Disney. She has renewed her contract, and will remain at the head of the table at least until 2021, when she'll either be replaced or continue on even further into the next decade of Star Wars. Kathleen Kennedy took the wheel back in 2012, when Disney purchased Lucasfilm from George Lucas for a cool $4 billion. She oversaw the franchise relaunch, which currently consists of four released movies, that include 2015's The Force Awakens, 2016's Rogue One, 2017's The Last Jedi and 2018's Solo. So far, the combine grosses have pulled in $4.5 billion, eclipsing what Disney payed to get the rights to characters such as Han Solo, Luke Skywalker and Princess Leia. The merchandise has also brought in billions more for the studio. Related: Emperor Palpatine Isn't the Only Surprise Return in The Rise of Skywalker? 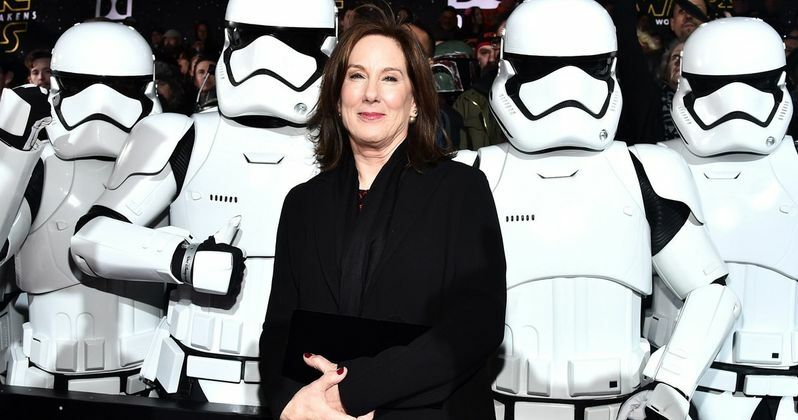 Kathleen Kennedy has come under scrutiny from fans who believe she is messing up the brand. While The Force Awakens was met with applause and general goodwill from fans and critics alike, The Last Jedi has been a sore point for a lot of longtime devotees. In rebooting this dusty universe, Kennedy has had to boot quite a few directors from movies already in production, including Josh Trank, who was set to helm the Boba Fett spinoff movie, Gareth Edwards from Rogue One, Chris Lord and Phil Miller from Solo and Colin Trevorrow from Star Wars 9. Within the Lucasfilm camp, Kathleen Kennedy's position is perhaps the most visible and she seems to be the one calling all the main shots. The renewal of her contract follows the disappointing box office take for Solo, which many list as an outright bomb. The movie grossed $392 million, which sounds great when read out loud, but factoring in the cost of axing the directors, and basically reshooting the entire script over, it is one of the most expensive movies of all time, and is estimated to lose between $50 to $80 million or more. While Kennedy is staying permanently in place for at least the next handful of years, the reaction to The Last Jedi and Solo have Lucasfilm and Disney rethinking their Star Wars strategy. Disney CEO Bob Iger promises the output for films will slow down. And the other upcoming standalone movies, which included Obi-Wan, Boba Fett, Yoda and Jabba the Hutt at various stages, are all on indefinite hold. The only announced movie is Star Wars 9, which is currently shooting and has been in production since August. That movie is keeping its December 20, 2019 release date in place. After that release, the playing field is wide open, and it's anyone's guess what will come next. Star Wars 9 will officially end the Skywalker saga. Lucasfilm and Disney are currently developing a new series of Star Wars movies from Game of Thrones creators David Benioff and D.B. Weiss which will feature all new characters, planets and themes. Apparently, Rian Johnson's proposed trilogy is also still in the planning stages. The near future for Star Wars is said to rest on the TV side of things, with more new characters being introduced on the small screen. Jon Favreau is creating a new live-action series that takes place after the events seen in Return of the Jedi. Star Wars: The Clone Wars is getting a revival. Both series will debut on Disney's new streaming service, which launches in the second half of 2019. New animated series Star Wars: Resistance will debut soon on The Disney Channel, but it has already been met with a lot of 'resistance' by fans who hate the look of the thing. Continuing her contract with Disney means Kathleen Kennedy will still be on board to produce and oversee Indiana Jones 5. That movie is set to hit theaters on July 9, 2021. It was supposed to come out in 2020, but scrip problems have delayed the final installment in the Harrison Ford era of the franchise. Earlier this month, Kathleen Kennedy and her husband Frank Marshal were named recipients of the Irving G. Thalberg Award for a "body of work reflect a consistently high quality of motion picture production." She will receive her honorary Oscar from the Academy of Motion Picture Arts and Sciences at the 10th annual Governors Awards on Nov. 18. This news first hit The Hollywood Reporter.